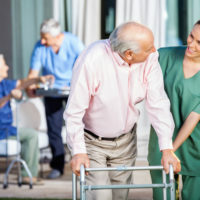 Isolation is often a great danger to elders living independently and, as an alternative to moving into a Nursing Facility or Assisted Living Facility, many elders have been able to remain living at home with the assistance of adult day care programs. The cost of adult day care varies depending on the program. Many programs accept Medicaid, which means if one otherwise meets the income and requirements, Medicaid may pay for all or a portion of the cost of day care. Adult day care centers provide a variety of recreational and social activities, allow seniors to enjoy the support of their peers, provide personal care/assistance with Activities of Daily Living (ADL) and they provide nutritional, health and social services. Some programs provide more intensive health and therapeutic services for seniors with severe medical problems and may even provide physical or occupational therapy. Transportation, counseling, caregiver support groups and education are other options that are often available, depending on the program. It is important when choosing a center that you talk with the staff, with other participants and with other family members to ensure the particular program is able to meet your needs, or the needs of your loved one. For example, Alzheimer’s Community Care has dementia-specific elder care centers throughout Palm Beach County and participates in Medicaid. If you have clients unable to stay alone during the day, or if you have clients currently caring for someone and they are struggling to balance their caregiving responsibilities with their employment outside the home, adult day care could be part of the solution. Please call our firm to learn more about adult day care and Medicaid’s eligibility requirements.